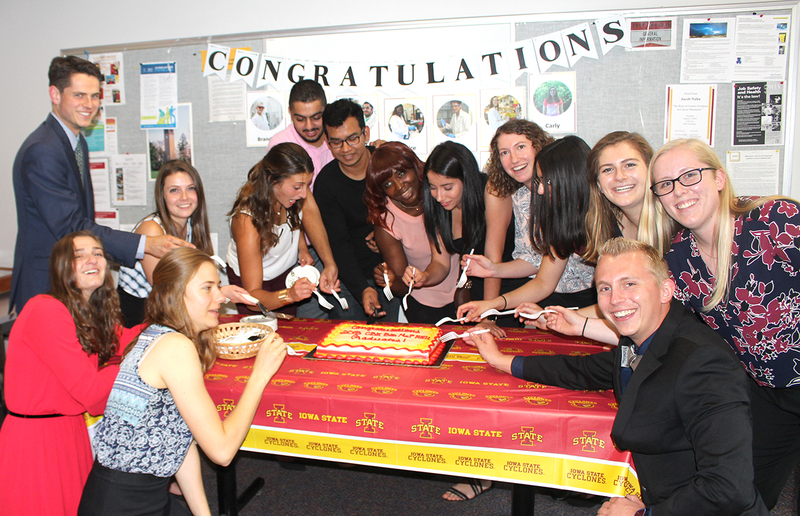 The BioMaP REU students prepare to study the chemical properties of cake and frosting at the department farewell reception. 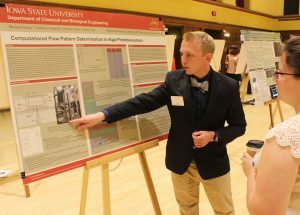 With participation in the university-wide research poster presentation and a reception in the department, Chemical and Biological Engineering’s (CBE) 13 BioMaP REU students concluded their summer of research at Iowa State. 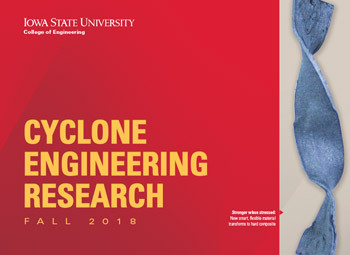 The program (Biological Materials and Processes Research Experience for Undergraduates) brings college students to the Iowa State campus to work under the mentorship of ISU chemical and biological engineering faculty and graduate students to gain hands-on research experience in topics that match their educational interests and goals. It is coordinated by CBE professor Monica Lamm, who was assisted by graduate student Russell Mahmood. This year’s participants were selected from 122 applicants. Academic levels ranged from incoming sophomore to incoming senior at respective schools in the fall of 2018, with majors, in addition to chemical engineering, including biology, biomedical engineering, anthropology, chemistry and more. 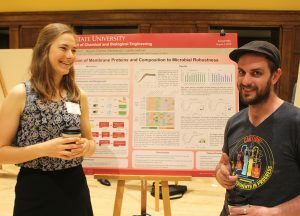 BioMaP student Eleanor Wettstein of Macalester College in St. Paul, MN, is shown at the poster session with CBE graduate student Aric Warner. Brandyn Moore of Bucknell University discusses his research at the poster session. Kristen Allaire, University of Rhode Island, Kingston, RI. Faculty mentor Andrew Hillier, graduate student mentor Russell Mahmood (Hyperspectral Imaging of DNA and Protein-Linked Metal Nanoparticles). Morganne Borsh, University of Northern Iowa. Faculty mentor Nigel Reuel, graduate student mentor Denis Tamiev (Resonant Biosensors for Enzyme Activity, Protein Binding and Ion Detection). Hannah Boyce, Northeastern University, Boston, MA. 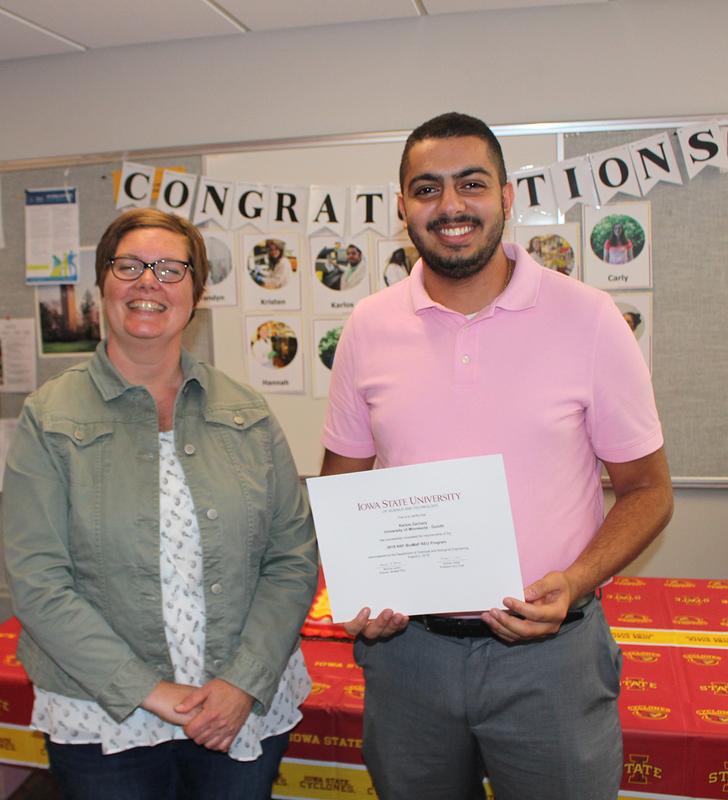 Faculty mentor Kaitlin Bratlie, graduate student mentor Anuraag Boddupalli (Polymer Properties That Selectively Target Tumor-Associated Macrophages). Laurice Chewouo, Des Moines Area Community College, Ankeny, IA. Faculty mentor Rebecca Cademartiri, graduate student mentor Robert Swenson (Bacteriophages on Porous Surfaces Used for the Detection of Bacteria). Carly Dolgos, Geneva College, Beaver Falls, PA. Faculty mentor Eric Cochran, post-doctoral mentor Sri-Harsha Kalluru (Lignin-Based Engineering Thermoplastics). 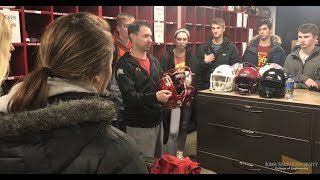 Jo Lohman, Drake University, Des Moines, IA. Faculty mentor Qun Wang, graduate student mentor Sherri Qi (ex-vivo Mini-Gut Mucosal System for the Investigation of New Oral Vaccine). Sadaf Maghsoudipour, Illinois Institute of Technology, Chicago, IL. Faculty mentor Derrick Rollins, graduate student mentor Dillon Hurd (The Artificial Pancreas Project). Brandyn Moore, Bucknell University, Lewisburg, PA. Faculty mentor R. Dennis Vigil, graduate student mentor Arya Ketchabi-Haghighat (Model Validation for Photosynthetically Active Radiation Transport in Algal Photobioreactors). Laura Pesquera-Colom, Iowa State University (biology major). Faculty mentor Surya Mallapragada, post-doctoral mentor Metin Uz (Drug and Gene Delivery). Trevor Simmons, University of Wisconsin-Madison, Madison, WI. Faculty mentor Thomas Mansell, graduate student mentor Samuel Rothstein (Probiotic Engineering). Eleanor Wettstein, Macalester College, St. Paul, MN. Faculty mentor Laura Jarboe, graduate student assistant Miguel Chavez-Santoscoy (Contribution of Membrane Proteins to Microbial Robustness). Brianna White, Kansas State University, Manhattan, KS. Faculty mentor Ian Schneider, graduate student mentor Shalini Unnikandam-Veettil (Competition Between Soluble and Extracellular Matrix Signals During Cell Migration). The program is funded by the National Science Foundation. 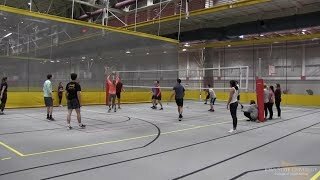 It will be held again in CBE during the summer of 2019. More information and registration will be available in early 2019. BioMaP REU student Laura Pesquera-Colom. 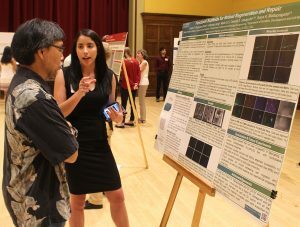 an Iowa State biology major, discusses her research. 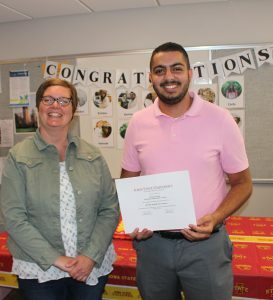 Karlos Zachary, a student at University of Minnesota-Duluth, is shown with BioMaP REU coordinator Monica Lamm at the student farewell reception. 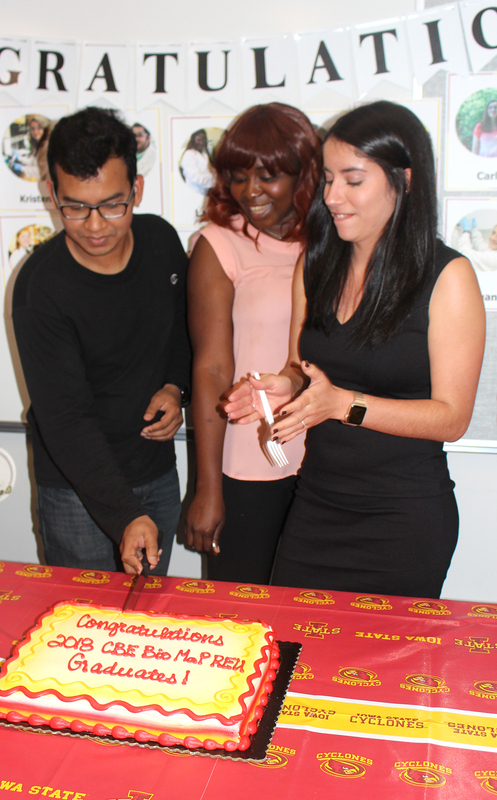 BioMaP REU graduate student assistant Russell Mahmood receives some advice on cutting the cake from Laura Pesquera-Colom and Laurice Chewouo at the student farewell reception.